"Living at Sunset Springs Apts is wonderful. The management and staff are friendly and helpful; the no-smoking policy is great; the grounds are beautifully landscaped and maintained. 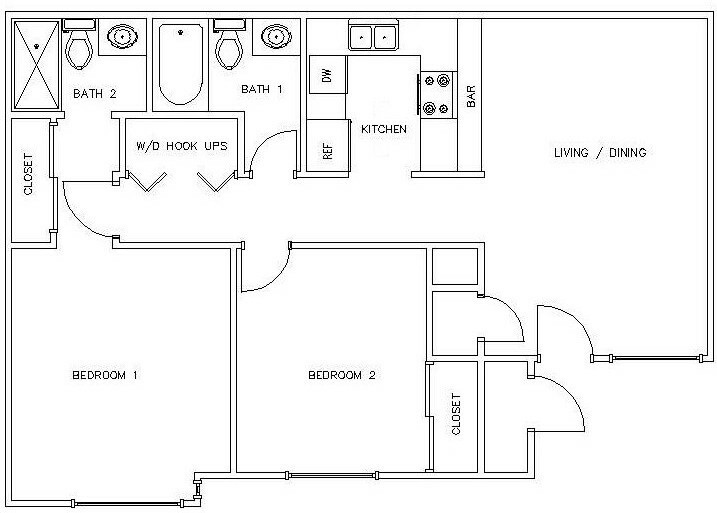 The apartments are all the same - 2 bedrooms and 2 baths, and are well kept up and affordable. You'll love it here!!!" "I have really enjoyed living here, the apartments are very nice and the common areas are very well taken care of and they continue to get better. I only had one problem that I had to come to the office for (ants) and within 30 minutes, the problem was taken care of. You guys have done an incredible job of making this a great place to live. Every time my family members or friends come down to visit, they comment on how well kept the apartments and surrounding areas are kept. If ever I have family or friends move into this area and need to find an apartment, you can bet that I will definitely recommend you. Thank you for being so great to work with!!" "What a wonderful and enjoyable place to live in our old age!" "I have absolutely loved it here, but I am moving to California. This place has been safe, quiet, and I have had fabulous neighbors. If I were to continue to work in this area, I would definitely stay here longer! You run a tight ship and I have loved the peace here! The grounds are gorgeous and the park has been a refuge.... This has been an absolutely quiet, safe, friendly place to live." "I would like to thank you for keeping our stay with you an enjoyable experience. This has been one of our favorite places to stay. We have enjoyed its clean and smoke free environment. I never noticed trash or anything dirty on the premisis that wasn't picked up or taken care of within 24 hours. It's been quiet and theft free of vehicles, that I have noticed, due to well lighted areas and strict policies. Debra has been wonderful to us and always willing to help us or answer our questions. She seems busy and hard at work with great devotion to the well being of this community." "I have lived in Sunset Springs Apartments for over 3 years and I enjoy living here. I have met many wonderful friends over the years. Owners are great people. The front office ladies are great, too. They help you with any problems you have. We have many activities to do here. All of the conveniences are close by. Come on over and join our community of friends. I think you will like it, too. It is a quiet community." "I have enjoyed my time here and have been very impressed with not only the facilities, but also the management and staff. They have made living here very enjoyable. I have lived at many different apartment complexes, and I feel that Sunset Springs has been one of the best. Thanks once again." ""I think Sunset Springs is a wonderful place to live!!! And I will and have recommended it to many! We lived there for almost eight years and LOVED IT!! But we sadly had to move from St. George because of a job change. Everyone there is very friendly and helpful. The manager there is especially great! She goes over and beyond and is extremely helpful! They were always very quick if there was anything to be fixed. And they are great about keeping up on things. They spray for bugs every 3 months so we never had any problems with bugs of any kind. They are always trying to improve the area. While we were there they put in a new play ground, resurfaced the parking lot, made a fun space with tables and a volleyball court, a place to play horse shoes, they resurfaced the pool! And they were great at trying not to inconvenience any of the tenants while making these wonderful changes! The swimming pool was great! It was never crowded. The apartments are pretty sound proof, we never really heard much around us (no noisy neighbors). We made many friends there. My kids loved being there in a friendly atmosphere and they especially loved the apartment manager! And they were really great and very fair when we moved out! It is really a great place to live and the price was the best one we could find around town too! And it is very family friendly too, they always had fun activities for the tenants (young and old)! I am going to miss Sunset Springs a lot! It really is a peaceful and great place to live!!"